Lego is releasing four space-themed sets to get kids excited more interested in science and tech. This story was updated at 12:12 p.m. EST. NEW YORK — The toy company LEGO this week announced a series of sets with space themes — from a space station and shuttle to a satellite launch pad — as a part of its partnership with NASA. The partnership is aimed to get more kids excited about science, technology and inspire the next generation of space explorers. The LEGO space shuttle model — which will hit shelves in March for $29.99 — also comes with a space telescope and a mini-figurine. Two smaller shuttle models will accompany the crew of the space shuttle Discovery when it blasts off from Florida this month. 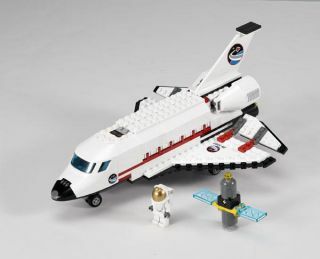 The other three sets in the NASA LEGO collection will be available in August, including the space center ($69.99). It comes with a control center, launching pad and four mini-figurines, and allows kids to get the space shuttle ready for launch. The satellite launch pad set ($19.99) comes with a communications satellite, and the space moon buggy set ($4.99) — a six-wheeled lunar exploration vehicle — serves to explore the lunar landscape. NASA will also be sending some of the sets to the International Space Station aboard shuttle Endeavour's STS-134 mission in April 2011. They will be assembled by astronauts — and student groups across the country — to demonstrate the challenges faced when building things in the microgravity environment of space. In addition, LEGO debuted at the 2011 American International Toy Fair its first ever Earth-based space theme, called Alien Conquest. Although LEGO has included aliens in its sets before, this is the first time the toy figurines have invaded Earth. Seven sets in this collection — from the Alien Mothership ($59.99) to the UFO Abduction Ship, which comes with an alien, defense force agent and farmer figurine (who can get beamed up) — aim to promote creative role play for kids. This story was updated to clarify which LEGO sets will be flying on shuttle Discovery. It was provided by TechNewsDaily, a sister site to SPACE.com. Follow TechNewsDaily staff writer Samantha Murphy on Twitter@SamMurphy_TMN.